He’s got a simple approach to his teaching – to make lessons simple and straightforward. 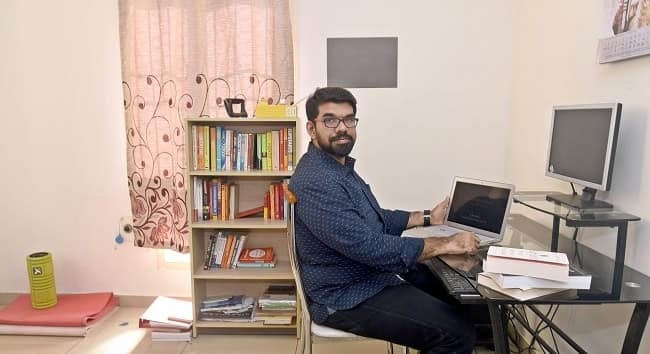 Dr R L Shankar, aka the Professional Simplifier, talks about his approach to keep things simple and how he uses tech to Seema Rajpal from EdEx Indian Express. It was the fourth of February when Dr Ramachandran Lakshmi Shankar took to the stage at TEDxGLIMChennai at Great Lakes Institute of Management, Chennai. He received a rock star-like welcome that included loud cheers, which rose every time he made a wise crack, and there were several of them. It was apparent that he is revered by the students. So, it shouldn’t come as a surprise that a 37-year old receives a rating of 4.97 out of 5 on his student feedback at Great Lakes, where he teaches Finance and Analytics. A lot of preparation went into that 16-minute TED talk, he tells us, much like the approach he adopts towards his classes. Before beginning any course, Shankar likes to start by asking students what learning outcomes they expect. Then, he decides the best way to teach the course. “But you have to covey not just the content but the pedagogy to the audience too, and once that is done, everything else flows organically,” he says. Talking about the traditional lesson plans that are still being used in classrooms, Shankar says that teachers need to stop thinking of themselves as repositories of knowledge and move towards being impactful disseminators of knowledge because, “students are not coming to you to access content; there are online resources for that. They are coming to you to be engaged with the content in a meaningful, challenging and inspiring way,” says the Nagercoil-born professor. And technology should be embraced first for the teaching community to do this to the best of their ability. But what about the teachers who remain resistant to tech? “Technology and faculty are mutually exclusive. They are simply complementary to each other. In fact, teachers become more relevant when they know how to use technology,” notes the IIT Madras graduate, confessing that he is an advocate of tech. As there is so much content out there in terms of online courses, YouTube tutorials and more, it is natural for both teachers and students to feel overwhelmed. But Shankar draws attention to research, which shows that in reality, 50% student subscribers watch only the first video and only 5 per cent finish the full portion. This is where the teacher steps in, providing the component of active engagement for the content that has been consumed. Apart from using technology in class, one of the techniques he uses is simplification, as he believes in making things simple, “but not simpler,” echoing the sentiment of a quote attributed to Albert Einstein, ‘Everything should be made as simple as possible, not simpler’. In fact, his friends back from his undergraduate days used to call him ‘professional simplifier’, just like the creator of the comic Dilbert, Scott Adams. In his quest to disseminate knowledge, Shankar has delivered customized workshops to corporates like World Bank, Bank of America, and more. These kind of workshops are much in demand he says, as employees are moving away from just thinking of their salary or shifting jobs, to focusing on knowledge enhancement. But teaching continues to be his primary passion, he states, “It runs in the family,” and he laughs while sharing with us that he comes from a family of teachers, lecturers and professors. And as a teacher, for Shankar, knowledge dissemination is as important as knowledge creation. “I am just lucky to have found my true calling,” he says, humbly. If Not a Teacher, Then What? Shankar is a voracious reader. So if not a teacher, Shankar would have been a non-fiction writer.